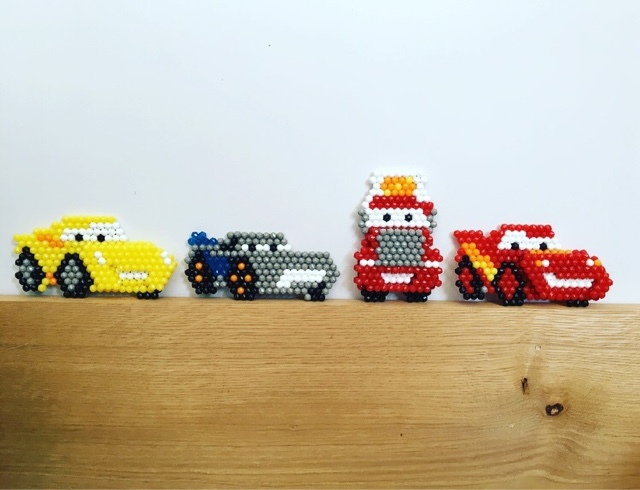 The boys have all been Cars crazy at some point or another and Ru bear is still completely obsessed. 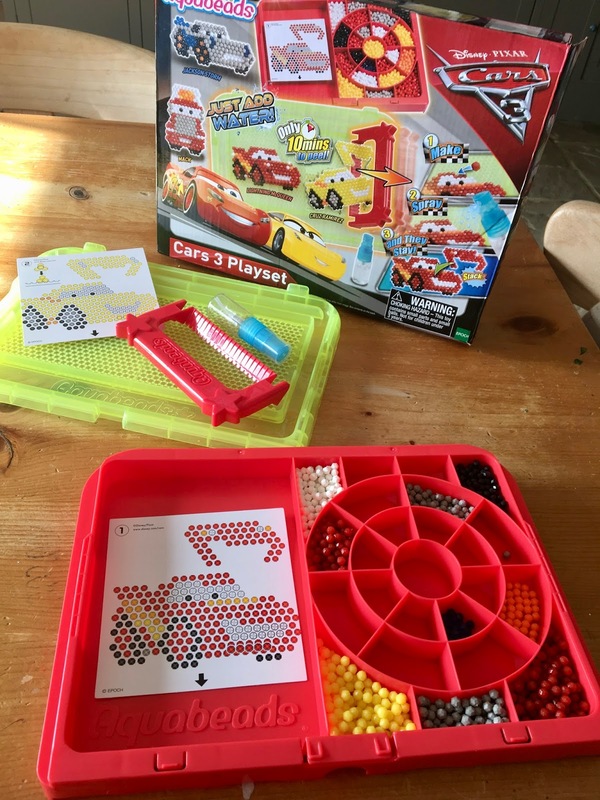 So when we were sent the Aquabeads - Cars 3 Playset they were all very impressed and couldn't wait to get started. Amazingly they each picked a character without fighting. 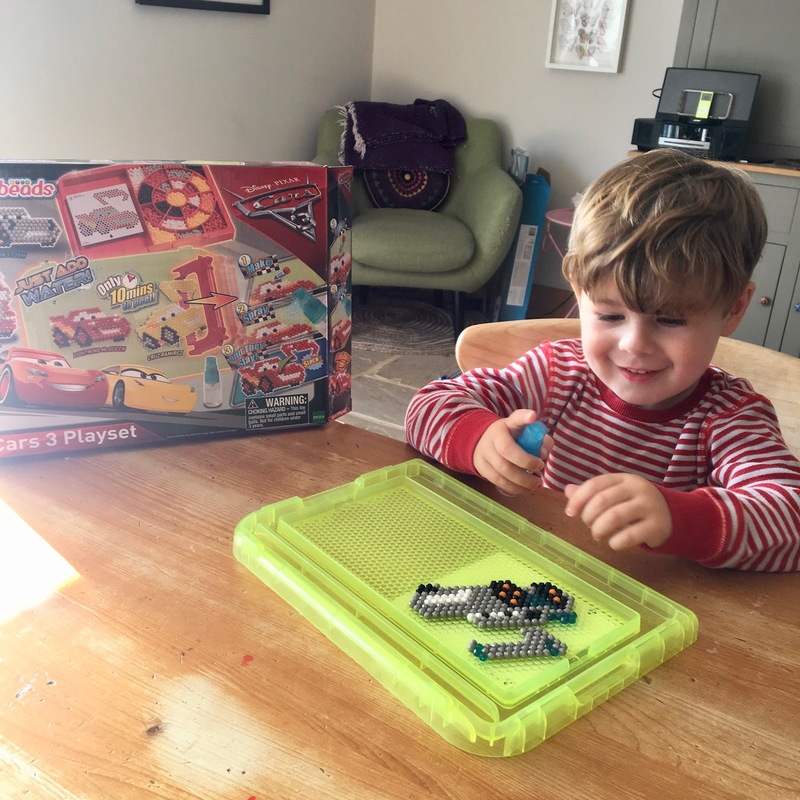 We all thought Ru would want his favourite Lightening McQueen but he actually went for Jackson Storm. Noah picked Mack, Alex picked Lightening and Oscar went for Cruz Ramirez. 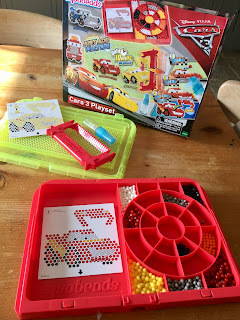 Helps to develop hand-eye coordination and memory skills. Just spray water and the beads stick together! Once you've picked your character just slot the template on the underside of the table tray and get placing your beads. Ru couldn't quite do it himself, so I gave him a helping hand and let him spray the beads at the end. He loved watching the beads eventually turn into Jackson Storm. 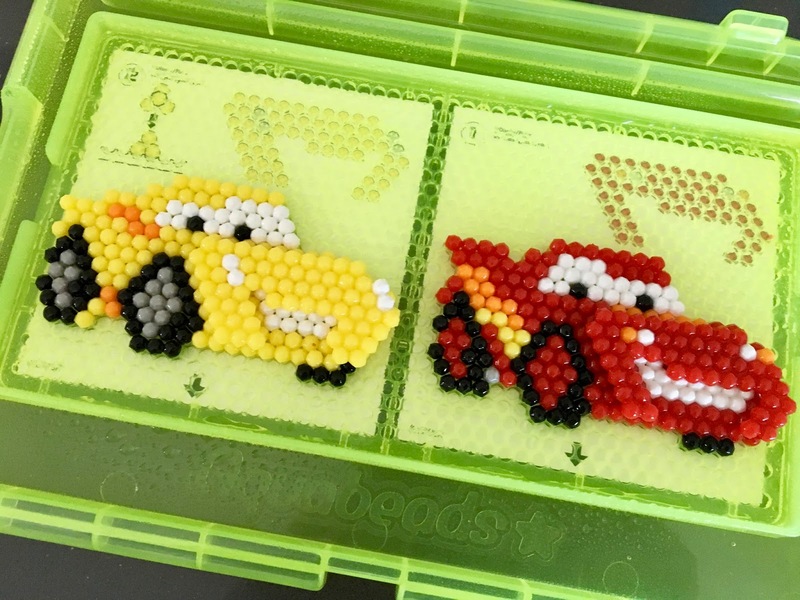 The beads only take 10 minutes to dry before you can peel them away from the tray and then up 60 minutes to dry completely. We left ours a little longer just to be on the safe side. The twins decided to have a race doing theres. Because Alex is left handed it was easy for them to sit together and place their beads down with out really knocking into each other. I think Oscar was the winner in the end but I'm sure if you ask Alex he'd say he was the winner! I thought Noah wouldn't want to have a go at making one but he really enjoyed putting together Mack and made sure he took his time to make sure it was right. He was very happy with the end result and now wants to get more Aquabeads play-sets! 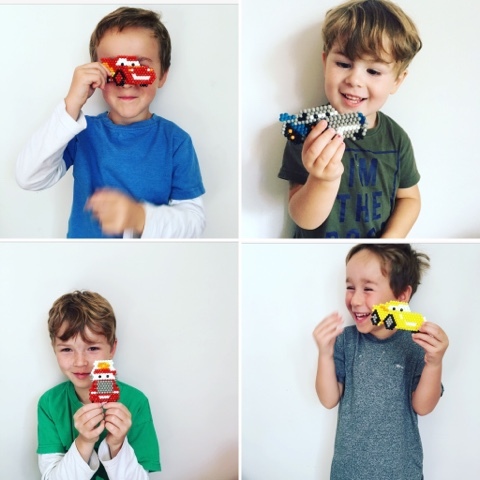 The Mini Beasts with their creations! Last week was a good week, my bestie came to stay for the week. 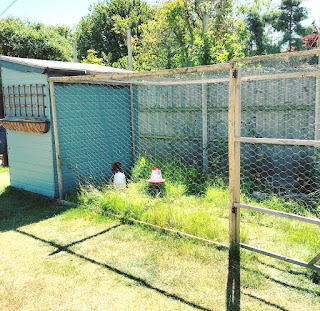 Rupert started the week out by turning into a bit of a naked gardener and we started his sleep diary. I also managed to send back the questionnaires we were sent. So hopefully by the time we are seen again this sleep diary will be full and they'll see how bad he is when it comes to bedtime. I also started a bit of a health kick and put my love affair with coffee on the sidewalk and turned back to Green Tea. I really want to start feeling better about myself and I can slowly see Im heading to where I really want to be. I know I'm never going to have my pre twins / Rupert body back as being just under 8stone is a tad unrealistic these days, but to not feel so flabby would be fab! Rupert made friends with another butterfly. He found it laying in the grass and gently picked it up and then played with it for about half an hour. Once the butterfly was done being friendly it flew off. On Monday Jenny arrived and we spent the morning with the boys and then just before lunch we headed off for a girlie afternoon in the Spa. Jenny had booked it as a surprise to help cheer me up. Before we went to the spa we headed off to Sainsbury's to see if I could pick up a new costume, as I had bought one from asos but when I tried it on, I could have cried. Unfortunately there were no costumes in Sainsbury's so we just ended up getting some lunch and then headed off to the spa. Once at the spa we changed into our costumes and put on our robes and headed into the waiting room to pick our treatments. I was wanting to get the raindrop massage but it turned out because I'd had my op only recently I wasn't allowed to have a full massage. My options were a facial and a manicure or a manicure and a pedicure. I was more than a little disappointed as I've never been keen on the idea of a facial as I hate anyone touching my face but then I decided if I wanted a little pampering I was going to have to give it ago. So I decided to try a mini facial and have a manicure. Before our treatments we hung out in the thermal spa and relaxation room. We had our treatments in a double room which was nice and to my surprise I actually really enjoyed my facial! I would definitely have another one! After the spa we headed out to dinner and it was alright but nothing really special. After moaning to my mum about how I was getting really upset about seeing everyone's pregnancy announcements and all their gorgeous new babies and thinking that was meant to be me. My mum decided to treat me to some new boots. They did pick me up and I felt happy walking around in them. Rupert went off to nursery dressed up as all the leavers were having a Disney dress up week, he wasn't really keen on going but as soon as I told him he could dress up and that Jenny and myself were going to take him he instantly decided that he would go. While he was at nursery we took the rest of the boys off to Hunstanton to have a go at pirate crazy golf. We split into two teams, Jenny, Jon and Alex and Myself, Oscar and Noah. I'm not sure which team won but it was a great way to spend the morning. Afterwards we headed up to Hunstanton Ice Cream factory and all had an ice cream. In the evening we had a bit of a games and ice cream night. We played Trivial Pursuit the 2000s edition and I was all set to lose because Jon usually wins these sorts of games but surprisingly I won! Which Jon was not too pleased about. Noah had his first ever audition for something Star Wars related. 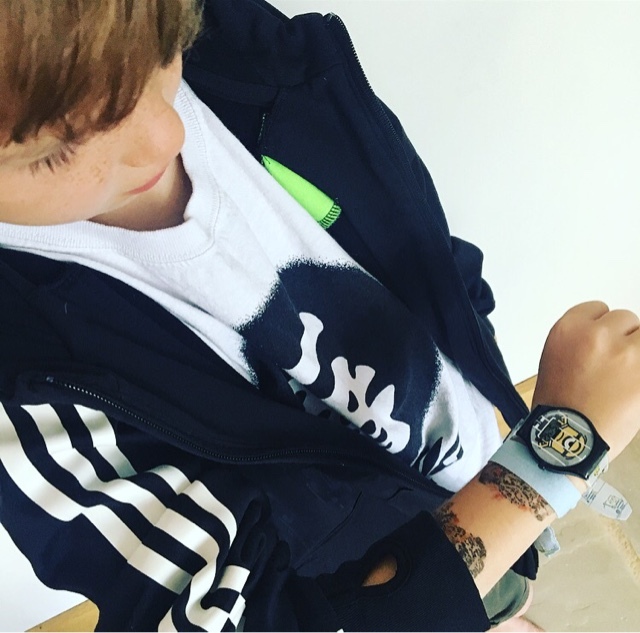 He's always liked the idea of going on an audition ever since the twins had one and after seeing his cousin Isla on a few TV adverts. He's really shy and Ive never really thought it would be something he'd want to do, but when I asked he jumped at the chance and said yes! I told him to just be himself and not get nervous when he saw the camera. He did really well, he was only slightly shy and did everything he was asked to do. He probably won't get the part but he said he really enjoyed himself and would do another audition if he got the chance. So to treat him we headed into Norwich to find somewhere to eat. We found Noah's favourite place - Yo Sushi and headed inside to grab some food. Noah was like a little meerkat peering over at the belt and seeing what he could see. Every time he got a new plate he did a happy dance. It was quite nice to just spend time with Noah. When Noah was little Jenny and I were always taking him on day trips, so it felt just like that. I really need to make sure I have little outings with just Noah as I'm sure he probably feels a bit left out, specially as Ru takes up a lot of my time. We all filled our tums and then headed back to the car. My favourite - Avocado Maki Rolls. We thought it would be fun to try and get home without the SatNav....we only got a little lost. It should have taken an hour but it took nearly two. The boys uniform all turned up and for Ru I decided to try him on some leggings which I got from the girls section. I know he won't wear joggers to nursery as he needs trousers to be super tight or he doesn't like the feel so I was pleasantly surprised that he really took to them and has been wearing them ever since! They're tight and soft, just perfect for him. I'll have to buy him some more for when the weather starts to turn cold. I've seen lots of cool ones on Zara and I'm also going to buy him some more Slug & Snails tights as he still tries to fit into his old ones. The boys pretending to be at a farm on our hay delivery. Jenny went home on Thursday and we were meant to be heading to my parents on the Friday but because of Jon's back still playing up we were unable to do the journey so to keep the boys happy we headed to Jon's parents to let them play in the pool. 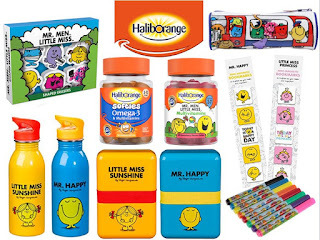 With September just around the corner I've teamed up with the guys over at Haliborange, the UK’s number one children’s supplement brand to host this amazing Back to School Giveaway. Whether your little one is starting school for the very first time, or they are going back after a Summer of fun, this prize bundle will be the perfect end of summer gift! Haliborange is a leading children’s healthcare brand. 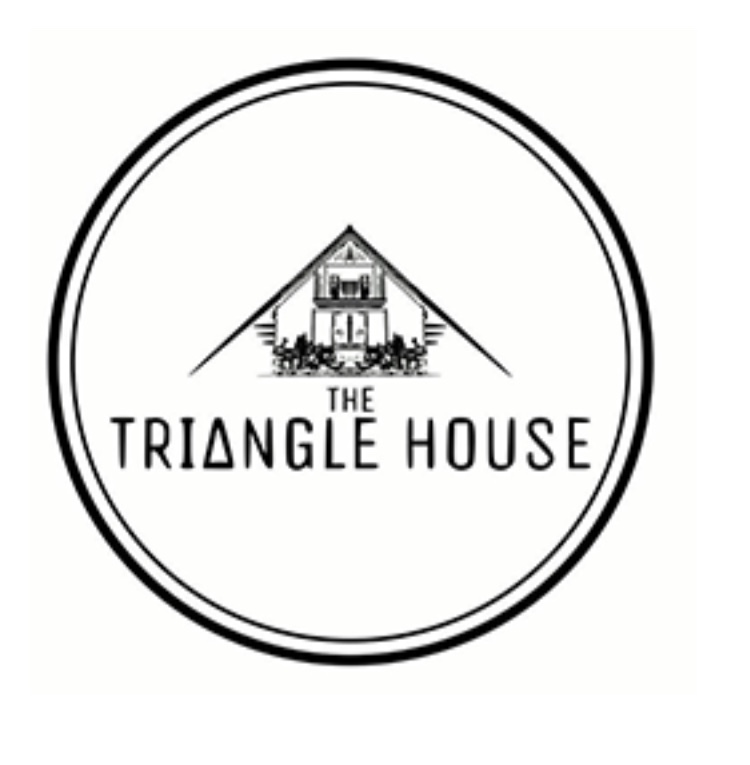 It produces a range of supplements aimed specifically at children. 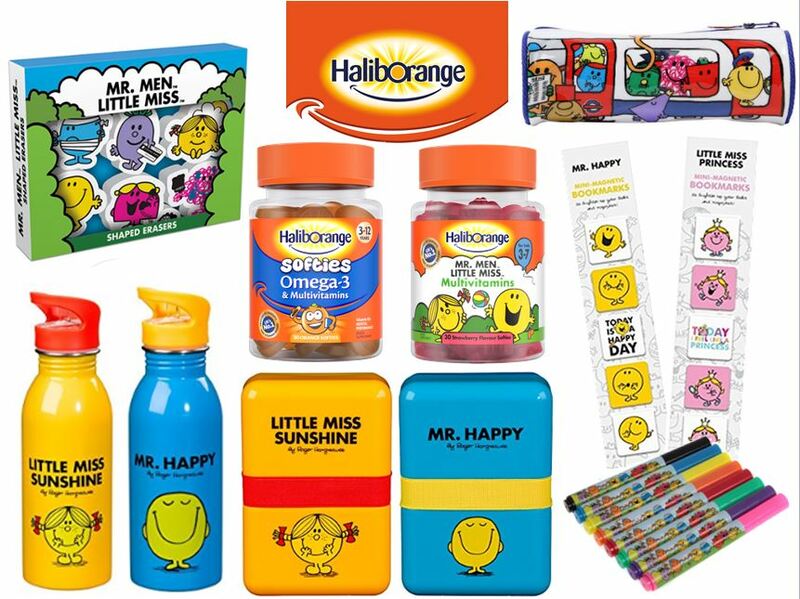 Made by the UK’s leading supplements manufacturer Seven Seas, Haliborange is the UK’s number one children’s supplement brand. Loved and trusted for generations, Haliborange is specifically tailored to support a healthy diet and lifestyle according to your child’s individual nutritional needs. Haliborange recognises that for parents today it can be a challenge getting children to eat a healthy and balanced diet, which is why the range features a whole of host of different combinations of essential vitamins and minerals to help support a child’s natural growth and development at every stage – from age one month to their teenage years. 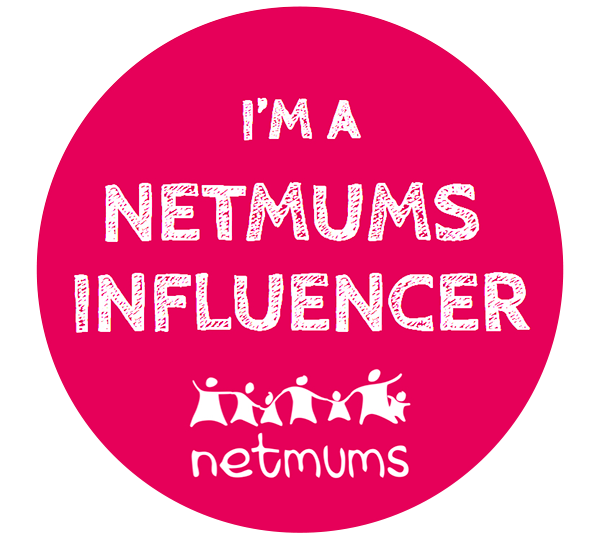 If you fancy winning the prize bundle just enter my Rafflecopter below! 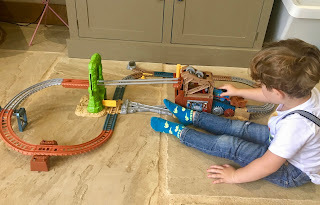 This awesome set is inspired by the new film Thomas & Friends Journey Beyond Sodor. The film sees new faces help Thomas on his action-packed epic journey, as he travels away from Sodor and across to the mainland, where he sees and experiences adventures that are beyond his wildest dreams. One of the locations he visits is the Steelworks, and now little engineers can bring their imaginations to life with this exciting new playset from the Trackmaster range, featuring a motorised Steelworks Thomas engine! 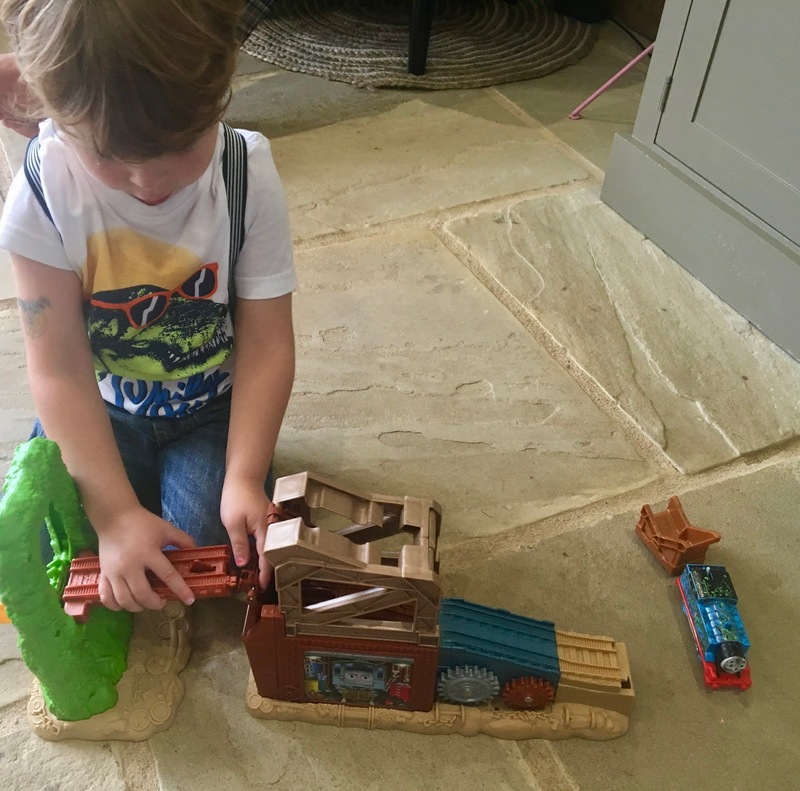 Rupert adores this Thomas & Friends track set and since we built it, he hasn't stopped playing with it. It took about 5 minutes to put together and Ru even lent a hand. Once it was all put together Ru started to push Thomas around but as soon as I placed the batteries inside Thomas and Ru saw that Thomas did it all himself, Ru went mad. 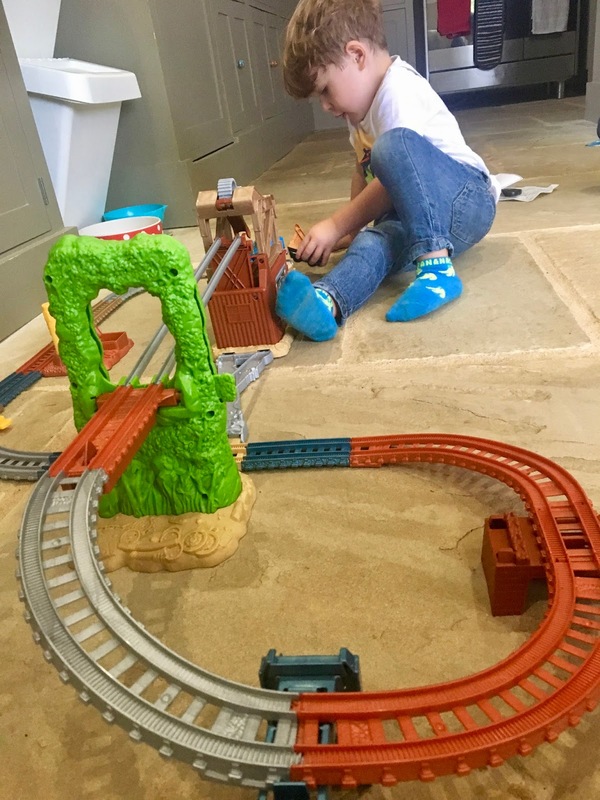 He loved rushing around and making sure the cable bridge was up so that Thomas could slide down it and collect his cargo. 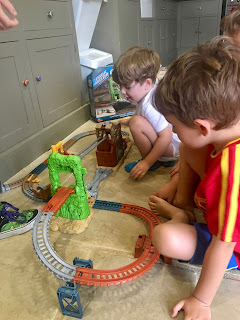 Ru was mesmerised by the motion of Thomas and happily sat their for the rest of the day. Even come dinner time, he quickly took a bite and then rushed back to sit in front of the track to make sure he put the cable bridge up and put the cargo back before Thomas came around again. The twins and Noah all sat around at one point trying to have a go, but Ru gave them his "don't touch my toy or I might chop your hand off" look and they just sat and watched. They all had their go when Ru was at nursery on Wednesday. This really is one of the best Thomas tracks we have and the boys all love it. 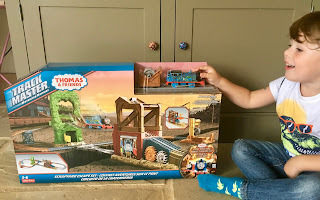 A must buy for any Thomas fan. Journey Beyond Sodor will be released on DVD on 16th October. 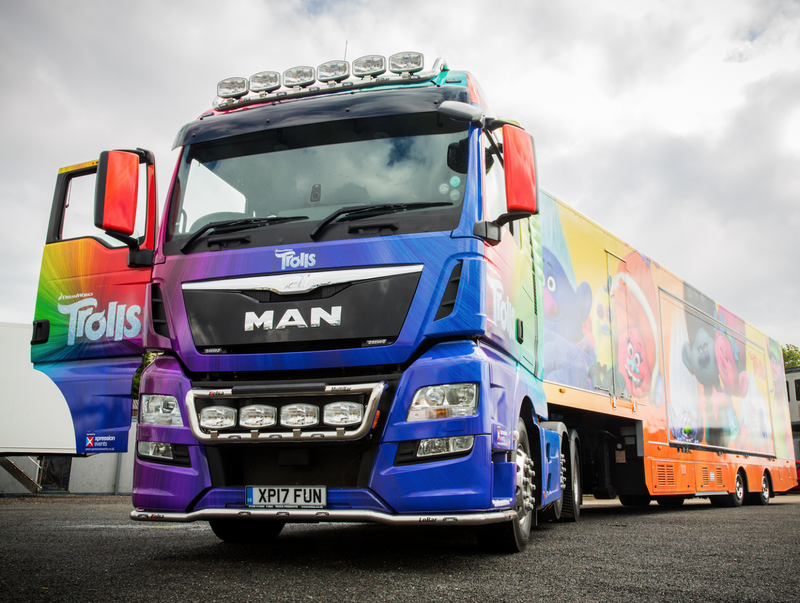 Head Along to DreamWorks Trolls Truck Tour at UK Retailers this Summer! Interactive Stations Include Cupcake Decorating, Crafting, Poppy’s Salon and More! 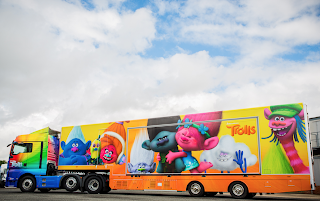 This summer holidays, fans of DreamWorks Trolls will be able to join their favourite Trolls characters on board the Trolls Truck, as it heads round on the country on a retail tour. At over 17 meters long, the Trolls Truck is packed full of Hair-rific activities for kids to explore! 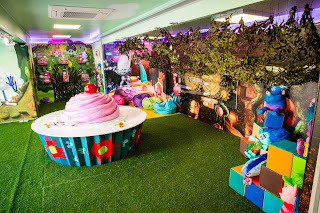 Featuring Poppy and the Snack Pack, the Trolls Truck includes a cupcake decorating station; crafting tables; a chance to Trollify yourself in Poppy’s Salon; a visit to Branch’s bunker; and much more! From the creators of Shrek comes DreamWorks Animation’s Trolls, a smart, funny, and irreverent comedy about the search for happiness and just how far some will go to get it. This hilarious film transports audiences to a colorful, wondrous world populated by the overly optimistic Trolls, who have a constant dance in their step and song on their lips, and the comically pessimistic Bergens, who are only happy when they have Trolls in their stomachs. After the Bergens invade Troll Village, Poppy (Anna Kendrick), the happiest Troll ever born, and the overly cautious, curmudgeonly Branch (Justin Timberlake) set off on a journey to rescue her friends. Together, this mismatched duo embarks on a rescue mission full of adventure and mishaps while trying to tolerate each other long enough to get the job done. Trolls sang and danced its way to theatrical success, opening at #1 in 28 markets and amassing $344M at the global box office. Utilizing music to further the film's narrative, the Trolls soundtrack is produced by Justin Timberlake and features five original songs, including Justin Timberlake’s Oscar Nominated “Can’t Stop The Feeling”, and songs by Ariana Grande, Anna Kendrick, and Gwen Stefani. After hitting a bit of a downer the other week, these past two weeks have been much better. I've been more productive and I'm starting to feel a little bit better within myself. Ru went off to nursery on Tuesday so we took the others for a walk in the woods and found a new route to take, which took us to brand new unclimbed trees. We also went off track and found a beautiful spot between all the trees where we collected pine cones for the wood burner. Wednesday Ru should have been at nursery but because the power was being turned off in the village his nursery is in he had to have the day off. So Wednesday was pretty much spent lining up all his Lightning McQueens. Oscar also learnt to ride his bike with out the stabilisers on, spurred on by Alex who had his taken off a week ago. It's nice to see how quickly they've taken to riding their bikes. As with Noah he's only actually really started riding his bike since we moved here and he went from not being able to ride at all to doing little stunts like standing up on the bar whilst the bike moves! I got some new tattoos. Getting a tattoo is way for me to heal when things have gone wrong. Back when I was a teenager I used to self harm (something I'm not proud about or something I really talk about) but as soon as I hit 17 and had a fake ID I was getting tattooed or pierced. It was my way of letting the hurt and pain out and turning into something beautiful. My thigh is a constant reminder of the bullying I went through throughout my school life and when I see it I feel sad but when I look at my tattoos I can't really remember why I was sad but I always feel uplifted when I look at them. I'm 31 and its still my therapy. When things go wrong or I'm feeling crappy I'll dye my hair and get a tattoo. It's an instant fix and something beautiful to look at day in day out. We took the twins and Ru to the Library for the first time, we got their a little early so we had to go and get a coffee while we waited for it to open. We headed towards the beach and popped into Hunstanton Ice Cream Factory for a drink. The boys each had a juice and Jon and I had a nice warm coffee. Once the library was open we headed back and let the boys choose some books to read as I'm getting pretty bored with reading the same ones over and over. The twins each picked a surprise bag filled with books. Each bag had a different topic. Oscar's bag was filled up with stories about magic and Alex's was filled up with stories all about Dinosaurs. Rupert picked a few new Peppa Pigs stories and one about Jack Frost. I also picked up a couple of books for Noah as I want him to get back into the swing of reading every day before he goes back to school! Yesterday we received a letter saying Ru is going to be properly tested for autism and were also sent a sleep diary that I have to fill in. Reading the letter made me start to feel really uneasy but good as the same time. To end the post a picture of the cat ... Why? .... Well why not!? 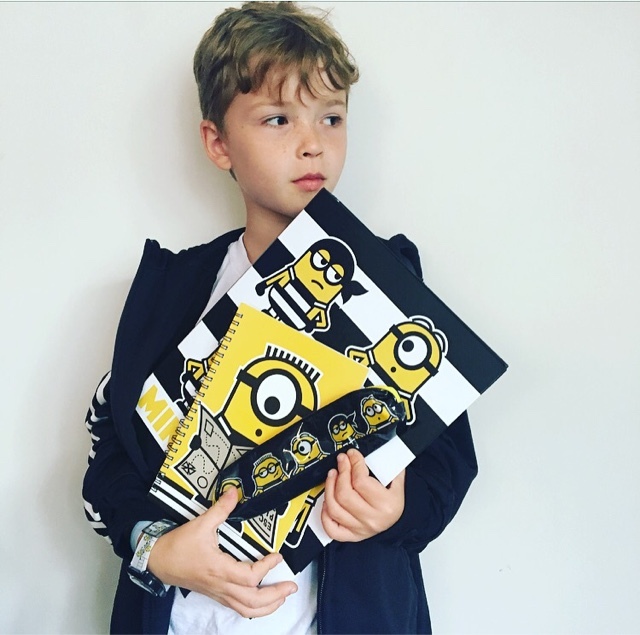 Are you looking forward to the kids going back to school? 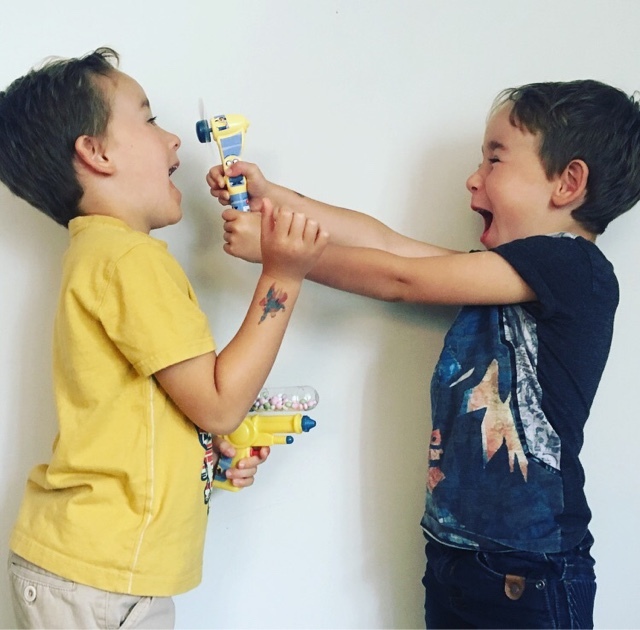 With the end of the 6 week holidays in sight its around now that most parents start to think about getting everything organised and buying those back to school essentials. 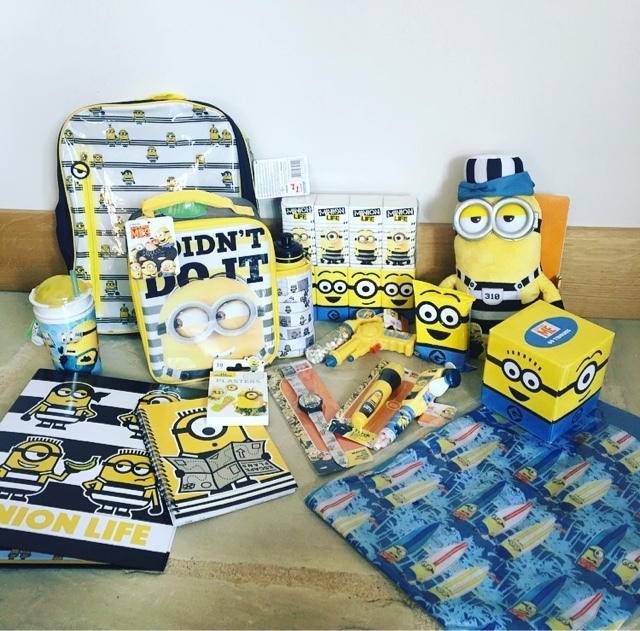 The boys were recently sent an awesome Despicable Me 3 Back to School bundle. 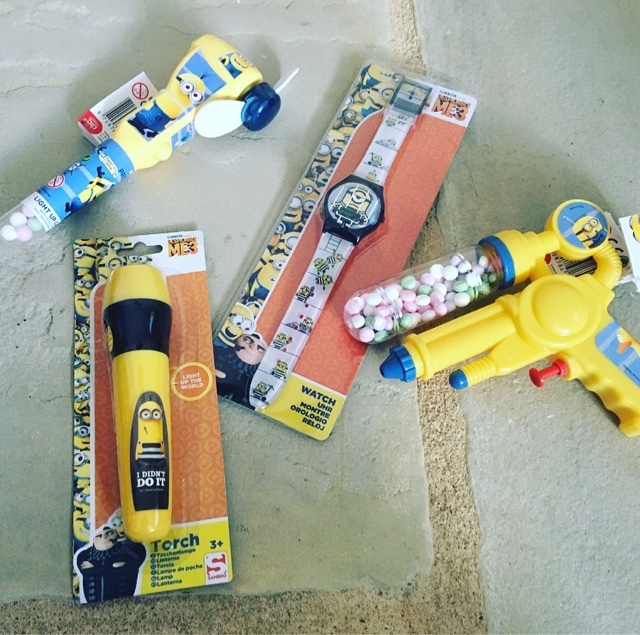 The boys all love the Minions and are desperate to see the new Despicable Me film so when they saw all these goodies they literally jumped for joy. 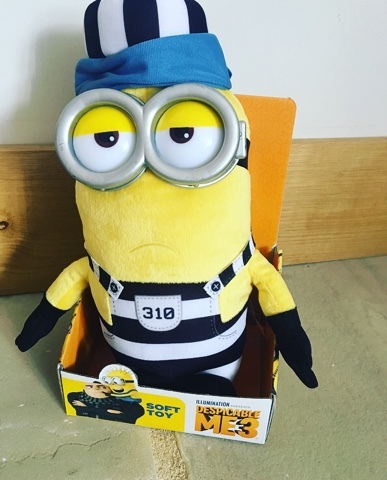 First up is this rather grumpy Posh Paws Jail Minion Tim..
Ru quickly swiped this for himself before the others could even say they wanted it. He's super soft and his googles are hard plastic, so they stand out nicely! He's perfect to cuddling up to after a long day at school / nursery. With all these I think I will be good all through winter! 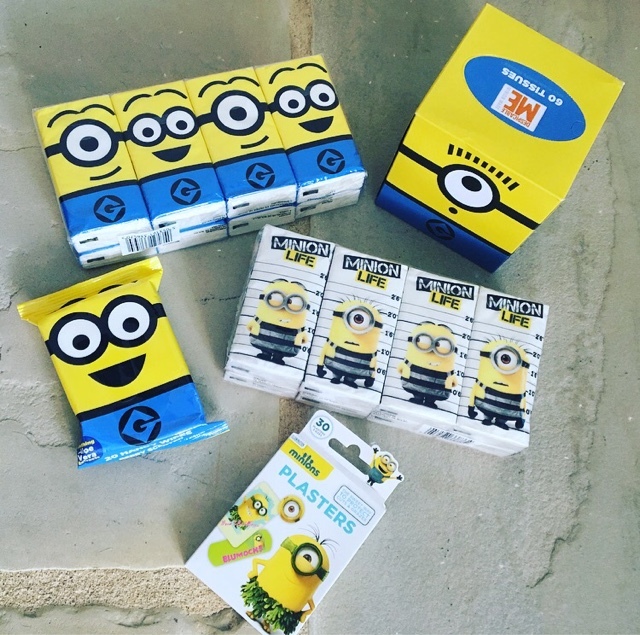 and a pack of Minion plasters - I know these won't last long because as soon as there are plasters in the house the boys always seem to find invisable/teeny tiny cuts all over their bodies that demand plasters straight away. and a handy I Didn't Do It torch. The twins haven't actually realised they can eat the candy thats inside yet, I'm waiting to see how long it takes them. The fan is great at keeping them cool after they've been zooming around the garden on their bikes and Alex loves pretending to shoot everyone with the gun. Noah's been after a watch for a while so was more than pleased when he saw this Minion one. He's a bit rubbish when telling the time so hopefully now it won't take him long to actually get the hang of it. Ru took the torch, I thought it would need batteries but it actually comes with them so you can use it as soon as you open it. The watch is currently on sale for £7.95 on amazon. 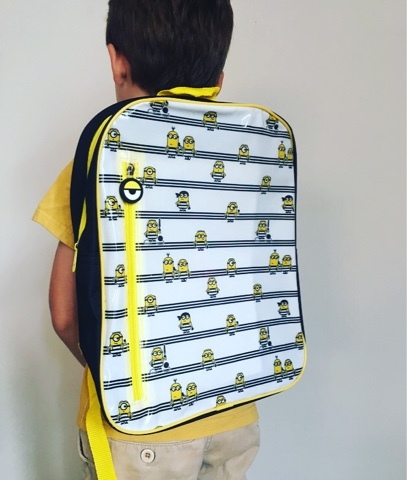 Next in the bundle was some very cool school gear..
A brand new Despicable Me 3 back pack that was filled with an a4 ring binder, a note pad, a pen and a mini pencil case. Alex has decided he wants the bag and Noah got the rest. 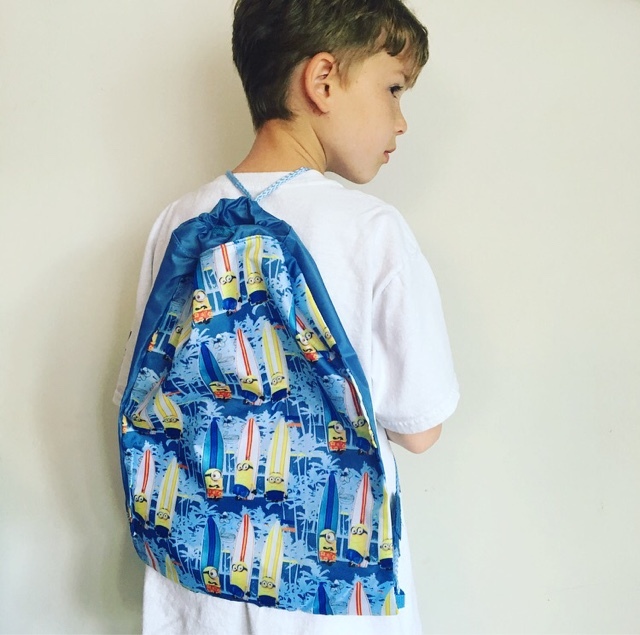 He'll use the stationery more than the twins and now being in year 5 he'll have to take more of his own stuff into school. The only place I can find this to buy is over on eBay for £10.95 plus postage. The boys have seen these being reviewed by some of their favourite YouTubers and were amazed that they now had one. 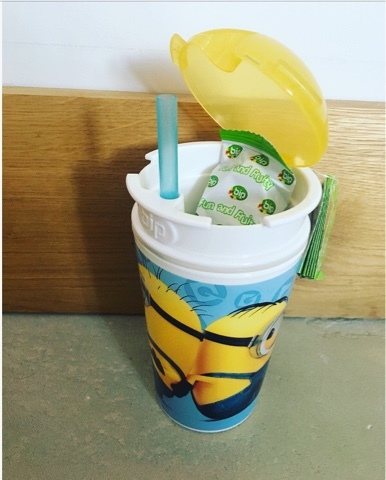 Just perfect for Ru who loves his juice and usually leaves his snacks all over the house for the dog to get. 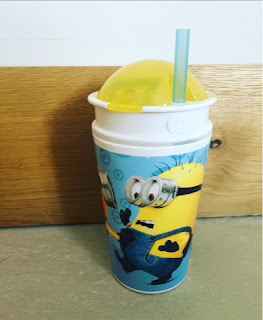 You can find a similar cup on here . Last term we bought Noah a swimming bag that was absolutely useless and ridiculously hard to carry as the straps kept breaking, so when Noah got this out the box he was insistent that it would be his new swimming bag. It would also make a pretty decent PE bag too. Last but not least, I Didn't Do It Lunch bag & cup. I've always been a meanie and said no to doing packed lunches as I'm lazy and hate making them but now seeing as Rupert will be at nursery full time and has to have a packed lunch I've said I would do it for Noah too. Which made him do a happy dance and then demand I do him ham baguettes everyday....seriously now do you see why I hate packed lunches?!? 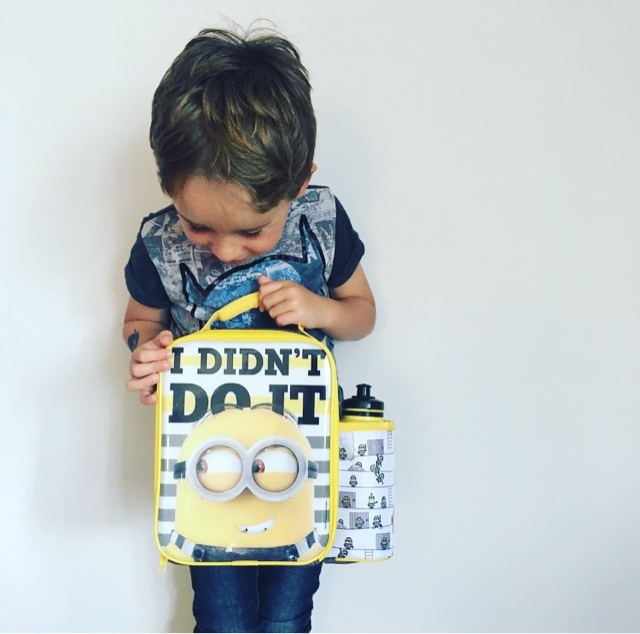 So this Minion lunch bag will be great for him to take it. It's big enough to get a decent amount of food in, and the handy drinks pouch is great to keep his water bottle together...as he's the sort of child that would lose it as soon as he stepped inside the school gates if it isn't attached to something. 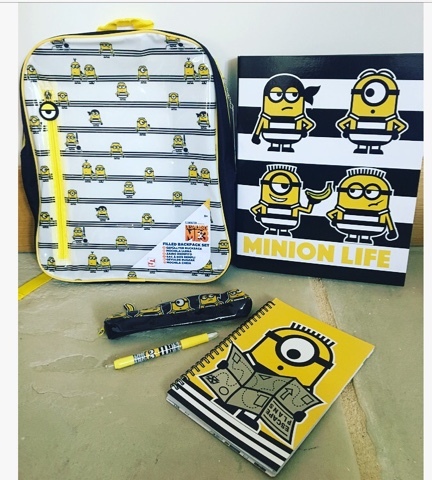 Have you got any Despicable Me 3 back to school goodies, if so let me know in the comments below.